Do black holes glow when they collide? When merging, co-orbiting black holes are sure to emit a burst of unusual gravitational radiation, but will they emit light, well before that, if they are surrounded by gas? To help find out, astrophysicists created a sophisticated computer simulation. 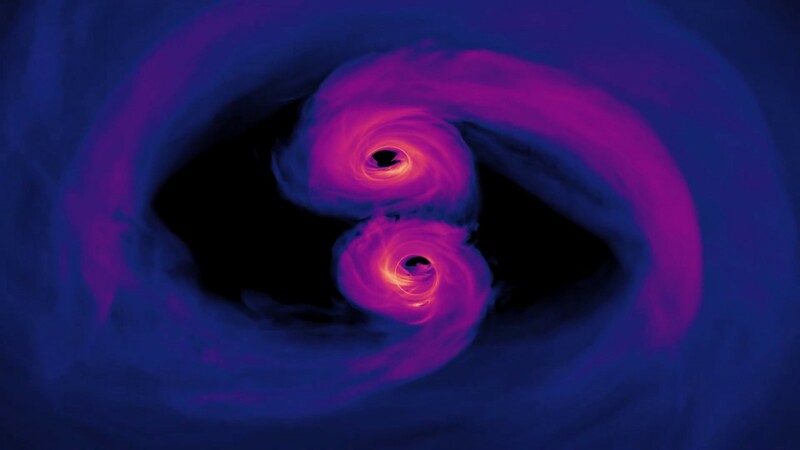 The simulation and featured resulting video accurately depicts two spiraling supermassive black holes, including the effects of Einstein’s general relativity on the surrounding gas and light. The video first shows the system from the top, and later from the side where unusual gravitational lens distortions are more prominent. Numerical results indicate that gravitational and magnetic forces should energize the gas to emit high-energy light from the ultraviolet to the X-ray. The emission of such light may enable humanity to detect and study supermassive black hole pairs well before they spiral together.